So, my new career in Nursing started by settling in to a new room at the Nurses Home, a new group of friends who were to be my colleagues for the next 3 years all lived on the same corridoor and between us we were to experience all aspects of Nursing, from the cradle to the grave. We had a lot of fun and knew how to party hard as well as cope with long shifts and hours of studying. Classroom activities were fun and the poor mannekin (Mrs Bedford Phennig) was tormented terribly, bedbathed, catheterised, naso gastrically tubed, dressed up for halloween etc, I know todays higher tech models can be cannulised and bled and some even operated on - but we managed and all passed our exams. I remember a couple of occasions where (being the joker of the pack) I caused a few laughs. One day I put one of those little laughing sachets in my bag and gave it a sly kick to set it off. Fortunately the tutor had a good sense of humour and joined in the contagious laughter it caused. Another time when learning about an eye condition called Ptosis (pronounced tosees) he said "what is ptosis?" quick as you like I piped up "little things on the end of feetsees" Uproar again. Happy days. We learnt most of our skills on the wards as part of the team and I well remember our very first trip from the claasroom to the ward to do blanket baths and then blood pressures and then being put on the off duty rota as a ward team member. It might seem like I'm looking at it through Rose coloured glasses but we had time to "care" in those days. You saw patients as people and we were taught to treat every patient as if they were a member of your own family. We laughed with them and cried with them, learned about their families and especially with the elderly listened intently to their experiences of wartime and rationing. Nowadays there is not the time. Students do degrees in Nursing in Universities and spend much of the time doing paperwork or attending meetings - it is left to the overworked Care Assistants to do all the basic patient care. There was no MRSA or C Diff - dressings were done in a Central Treatment Room away from the wards and handwashing was done as a matter of routine. Helping deal with a man who had locked himself away in a side room and hanged himself. He had stomach cancer and none of the analgesia we could give him helped his pain. He had just had enough and used his pull cord and tied it around his lamp. I couldn't sleep with the light off for several weks after that as I kept seeing his face. Attended the hurried christening of a newborn baby. The Priest couldn't get there so the Consultant Paedriatrician performed the ceremony as the baby breathed his last. The Sister of SCBU saw me in tears and said it was good that I showed emotion, I was then encouraged to wrap the baby in a blanket and take him to his parents on the ward. They hadn't seen him as he was rushed away after being born by caesarian. I passed him to them and sat and wept with them for a while before taking some photo's of them together to remember him by, before leaving them alone with their grief. Later the Sister got me to lay him out in a tiny shroud with a single rose bud and take his body in a small white box down to the mortuary. Many times I sat and held the hands of the dying, comforted in the thought that they were not alone at the time, often there were no relatives or they lived too far away to attend the bedside of their loved one and it helped them to know that someone had taken the time to be with them at the end. An elderly Irish lady died one day and in her belongings we found a small prayer card. We stopped for a moment bent our heads and I said the little prayer out loud. She was a Catholic and although I'm not I felt it was the right thing to do at that time. On a happier note I remember comforting a young 17 year old in labour, her family had disowned her and the boyfriend had scarpered (as they do) she had a very long labour and I stayed beyond my shift to be with her. Eventually they had to take her to surgery for a cesaerian and the ward rang me later to say she had had a 10lb+ baby boy. She put me in his baby book as "my favourite Nurse" To think he would be 19 now! I rejoined the Red Cross as an adult while I was training and kept up the first aid duties and training. Because of this the Nurse Tutors always trusted me and often asked me to babysit for them, the extra money was always helpful and it gave me some quiet time to study (with help if I got stuck on anything when they came home!) I wrote an article about my Red Cross work which I submitted for consideration for the Senior Wentworth Reeve Award. I was astonished when I won and received £30 (a lot of money which I brought my buckle with when I qualified) and my name was inscribed on the wooden plaque in the foyer. My parents attended the ceremony and they were so proud. 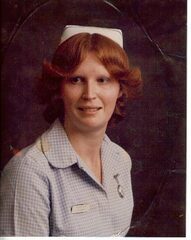 When I had been qualified a year I went to work as a Staff Nurse and Senior Staff Nurse on Night Duty at Newmarket General Hospital. I worked mainly on the medical wards, Coronary Care, ITU and usually on the Chest Unit. This was developed into a National Centre which was opened by The Princess of Wales but sadly closed a few years later when it all moved to Papworth. 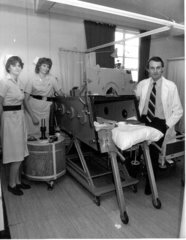 I was part of a team of Nurses who restored and brought back into use some derelict Iron Lungs. We were featured in local and national Press and I was even a TV star on Anglia News where my friend Julie Songer and I were filmed putting a patient in and connecting it all up. In 1988 I began a District Nursing course which I passed the next year. I had the qualification DN Cert and became the Bank District Nursing Sister for South Cambs. Unfortunately due to my height and the fact that my caseload changed from day to day, it meant that I had to cope with many heavy patients in difficult surroundings. One day just 3 months after qualifying, I had to move a heavy lady who had recently had a stroke across the bed to prevent her falling out. As I did so I felt a sharp pain like someone had stuck a sharp knife in my right buttock and sliced it down my leg. I could not let it show as the patients husband had recently had a heart attack and I didn't want to worry him. With tears welling up in my eyes I sat and wrote the patients notes. I got out to my car and burst into tears as I struggled to get in. With excrutiating pain I finished the days patients and went home. Essentially my Nursing Career ended there, I was off sick for 6 months before being ill health retired at the age of just 29. I was headhunted again whilst I was off sick, a senior member of the Red Cross visited me at home and asked if I would consider being the Newmarket Branch's Nursing Officer. Although it was only voluntary it gave me the opportunity to use my knowledge and skills to teach other members the rudiments of Nursing in the home. I also continued to do voluntary first aid duties which involved no lifting and I was able to sit down most of the time which relieved the back pain. A year or so later I went to my GP for more painkillers and knowing I was Nurse and seeing me at the races as a First Aider asked if I would like a job at the Practice - I had been head-hunted again. He obviously knew of my back problem but there would be no lifting and it was only 12 hours a week. I was useful again! I enjoyed this work much of it was assessing the elderly and advising people on healthy lifestyles. I stayed there until 1992 when I found my Mr Wonderful and moved out of Newmarket to live with him near Mildenhall. 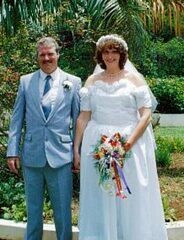 We were married in Jamaica the following year, he was unconcerned that he was marrying a pensioner. We met through a singles social club. This was very successful - the girl running it when I joined had met someone through it and was looking for someone else to take over. I was the "chosen one" see head-hunted again! but I had only taken over for a month or so and this handsome hunk came to join up. It was love at first site and we have been together ever since. The Newmarket Branch had to close as nearly everyone had paired up. If anyone reading this is lonely don't be afraid of singles clubs they are really just a way of getting out and meeting friends of both sexes and going to parties, walks, cinema or whatever with others who have similar interests. It worked for me BIG TIME! In 1996, after a while just being at home I thought I'd liketo go back to work again and signed up for a Back to Nursing Course, once again at Bury St Edmunds. I completed the course - working in CCU and Cardiology and although I enjoyed it found it very hard and different to how I'd remebered it. I passed the course and got 20 points at level 2 (What?? this was all new!) for an assignment I completed called "Where is the Iron Lung now?" based on my experiences at Newmarket and was signed up as a Bank Nurse. I worked a couple of night shifts but was upset when another Nurse had been moved from her usual ward to accommodate me because I couldn't lift said "if you can't lift you shouldn't be here" I wrote to the Nursing press who printed my letter which I hope she read. I persevered with a few more night shifts but had to leave as the work was so hard and there were too few staff. I was exhausted. I joined a Nursing Agency and they found me some non lifting posts mostly at a Sue Ryder Home in Ely. I worked afternoon shifts usually on the top floor which accommodated residents with Multiple Sclerosis - the irony of this was yet to hit me. My husband also worked there as a Care Assitant for a while and it was nice to work together. He is very strong and found the lifting easy, especially when another male Carer was on the same shift. I had time to spend with the residents and once again found a purpose in my life. One day in 2001 I spotted an advert for a Practice Nurse specialising in Heart Disease patients at the surgery nearby. I applied and thanks to staff at the Sue Ryder Home who gave me a reference I got it. I was there for 12 hours a week. I worked 2 afternoons as a General Practice Nurse and one running the CHD (Coronary Heart Disease) Clinic. Lovely I was back in my comfort zone.